For more information visit: mgmresorts.com/CSR. 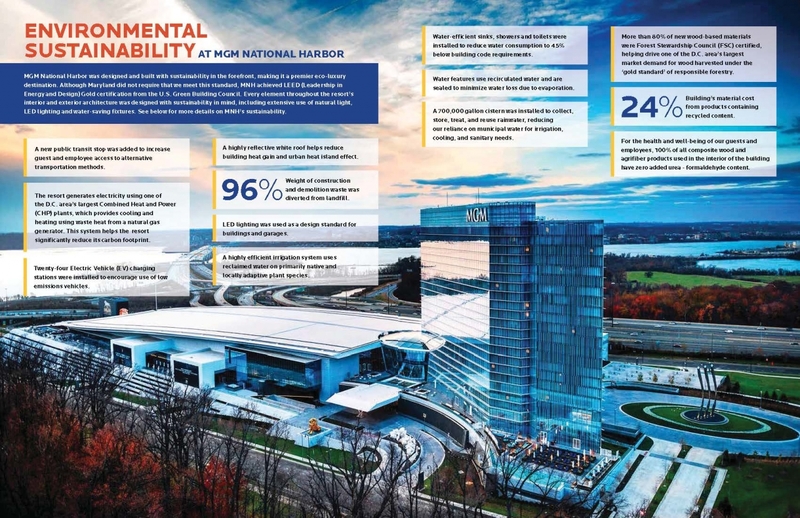 MGM National Harbor was designed and built with sustainability in the forefront, making it a premier eco-luxury destination. Although Maryland did not require that we meet this standard, MNH achieved LEED (Leadership in Energy and Design) Gold certification from the U.S. Green Building Council. Every element throughout the resort’s interior and exterior architecture was designed with sustainability in mind, including extensive use of natural light, LED lighting and water-saving fixtures. See the above infographic for more details on MNH’s sustainability.